The purpose of this note is to recollect on a few things I learned as part of putting together a visualization/data analysis of 100,000 Amazon searches; the visualization is located here. This was the first time I had used D3.js to create a table with both text and charts created from the same dataset. The somewhat long-ish details of this are in the next-to-last section below. 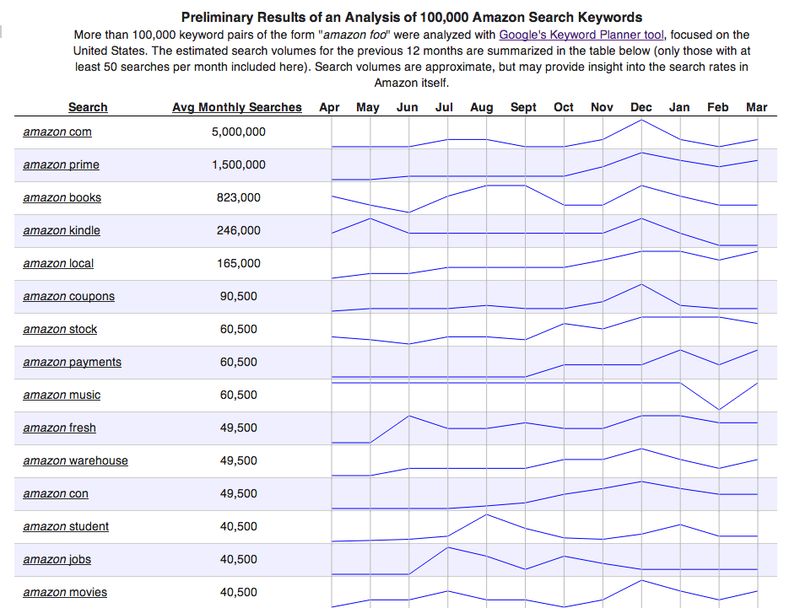 The first few rows in a big table of search volumes for Amazon searches. The full table is available here. 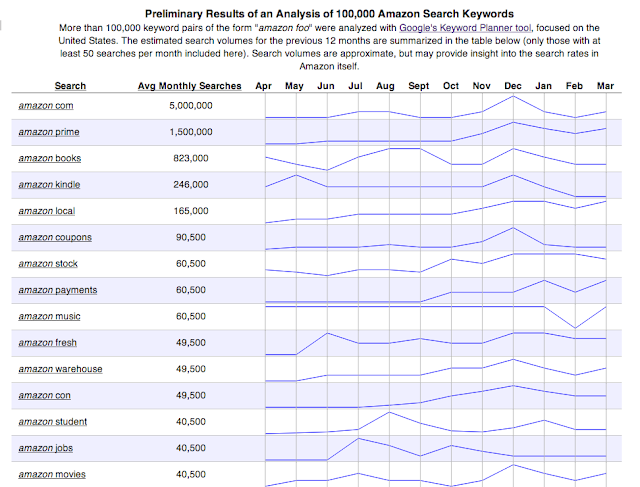 Basically, you can see search volumes and monthly search patterns for many terms that have the word "amazon" in them. I do not think that you can get this type of information from Amazon; however, coupled with the information from Google's Keyword Planner tool, it might serve to provide some interesting signals. I first created a list of 100,000 terms of the form "amazon [word]", where the words were from this 1991 list from SIL. I'm sure I can find a better longer and more current word list (e.g, one from Peter Norvig from around 2008), but I haven't returned to this. Plus, if you're going to post the results somewhere, there can be a lot of distracting adult words that must be culled. After taking a look at this file in Excel, sorting a bit, and deleting some of the columns, I saved it back as csv for the file that is actually used for the visualization, and at that point also shortened some of the column names. I ultimately pruned this file to just those terms for which there were at least 50 searches per month - this resulted in a file with about 2300 lines, and weighs in at about 220k. The data file is loaded into an array of custom json objects when the page loads, using D3's "d3.csv(...)" function. Using a fixed table header is critical for something like this. I tried a few of them - several insisted on changing the html that really borked up the table. The one I ended up using was StickyTableHeaders by Jonas Mosbech. It just worked. Given the huge range of values, it didn't seem useful to graph the average monthly volume. Instead, just presenting the number (with commas) seemed sufficient. However, some kind of graph for the monthly patterns did seem useful. While it was a little more work, I decided to use an svg line chart for these. Raw numbers were right out - your eye can't detect the patterns very well that way. Bar charts, created either with D3 or raw divs, would result in the bars themselves consuming a lot of visual space that could distract. Thin line charts, however, given the eye's evolutionary powers of edge detection, coupled with our own innate sensitivity to outlier patterns (e.g., peaks), seemed appropriate, especially as a way to allow quickly scanning through rows and rows of the table. It was a little trickier than I expected to use D3 to make this work. Of course, I could have taken a more hands-on, D3-less approach to creating the table and the charts, but I have always found that it has been more than worthwhile to spend a little time digging into the power of D3. // there is one such object for each search term "amazon foo"
//Prepare to create the different columns. // "amazonData" attached to the parent object "rows". //This is yet more D3.js magic! //to the parent object "rows"
//   scaling functions. Did lots of silly putzing with this. I am currently rendering the entire table when the page loads. It would be smarter to just do this on demand. I hope to poke at adding some notes to the data regarding any trends that look interesting. For example, I imagine that "drones" peaked in December 2013 not because it was high on everyone's Christmas list, but because that was when Amazon's drone program was announced. I did a number of things to try to result in a table that can be effectively browsed visually - various horizontal/vertical lines (thickened on mouse hover), alternating colors, etc. However, I think there are still some challenges and improvements to be addressed with this.